2016 Was An Excellent Year for Bad Girls. Immediately after Bad Girls Perfume launched on April 1, 2016 at Esxence in Milan, all sorts of crazy Bad things began to happen. For one thing, and that very day, Bad Girls Perfume was seen in the company of some pretty shady characters. Saskia Wilson-Brown and Helder Suffenplan. Don’t even ask. Then that night, things went from Bad to Worse at a totally wild party at the Palazzo Giureconsulti in Milan, inspired by Federico Fellini’s La Dolce Vita and Bad Girls Perfume, of course. Outside, and in the fountain no less, Irina Protrin, AKA Parisienne Bomb Shell, and Ermano Picco AKA “Magnifiscent” set the Bad Bar pretty high. Rumor has it that the fountain was flowing with Jacque Fath’s Green Water. Photo courtesy Esxence. Inside, Bad Girls held their own. Bad Girls with Ermano “Magnifiscent” and Silvio Levi, officially known as the founder of Esxence, but better known in the milieu as King of the Latin Lovers. 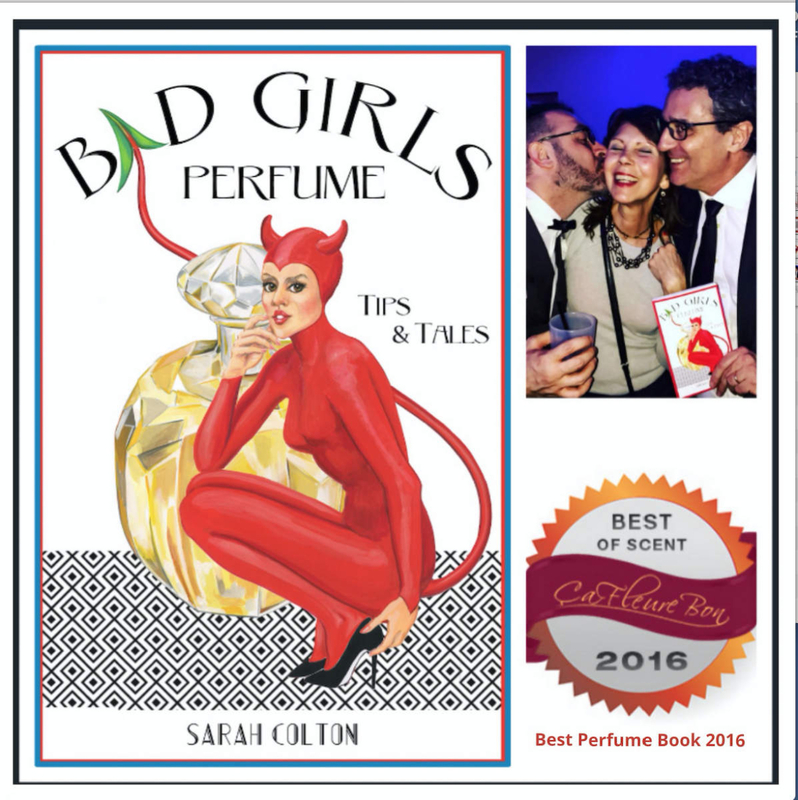 Within a week of launch, Bad Girls Perfume was creating a stir and causing raised eyebrows in some of Paris’s finest establishments. Indeed, the naked truth was that Bad Girls were literally selling themselves in reputable Perfumeries and Shops around Europe, including such esteemed addresses as, Jovoy, NOSE, The Different Company, Etat Libre d’Orange, and Atelier Cologne in Paris, Calè in Milan, Skins Cosmetics in Amsterdam, andSkins Cosmetics in Luxembourg. On another front, Bad Girls Perfume Parties, Workshops, and Book Signings cropped up uncontrollably in various European and American cities. And that was only the tip of the iceberg. Unbeknownst to many, Private Bad Girls Perfume Parties and Bad Girls Perfume Hen Parties were taking place across Europe, Canada, and the US behind the closed doors of private homes, restaurants, hotels, and clubs. Although a seemingly impenetrable code of omertà seems to reign among participants, anonymous sources have reportedly stated that many such Private Bad Girls Perfume Parties and ALL Private Bad Girls Perfume Hen Parties generally turn out to be…well, raucous. Sorry, no photos…..
— What Happens at Private Bad Girls Perfume Parties STAYS at Private Bad Girls Perfume Parties! To find out more, or schedule a Bad Girls Perfume Workshop or party of your own, click the Workshops Tab on this site or click here. Spoiler Alert: Some of us did get BUSTED while reading subversive literature to under-aged Santa’s Elves at NOSE though. In July and August, an entire school of Bad Girl Mermaids and their Perfumes were let loose on the Seven Seas, beaches, and pools of the planet. For details click here. Luckily, the temporary spike in Global warming caused by the passions engendered by their swishing tails, was compensated by a tsumani of COOL and refreshing colognes, splashes and Eaux flooding the globe at approximately the same time. For the complete story about Bad Girl Mermaids (the tale lies in their tail), or the cooling effects of colognes, refer to Bad Girls Perfume Chapter 6 Advanced Techniques for Special Prey, and Chapter 9 Keeping Cool Under Fire. Autumn was HOT in Florence where things continued to degenerate at Pitti Fragranze. Certain fragrances in the hands of Bad Girls reportedly caused traffic disturbances among Italian taxi drivers click for details, and Bad Girls were spotted conniving with reputed n’er do wells in the niche fragrance industry. Magnifiscent Instagram post caught Bad Girls in the act of propositioning innocent bystanders at the Ulrich Lang New York stand, with Zaneta Rodic, owner of Institut Parfumeur Flores in Zagreb, Uli and APSU, reputed hallucinogenic fragrance. Can it get any worse? Oh, Yes. Much ! Lots of REALLY Bad things coming up in 2017, including public and private events and parties in London TBA in January, and New York City TBA during the week of February 13-20. Wishing you a Bright and Happy New Year 2017.